I HAVE a strange affinity for those reality shows where teams of people go into incredibly messy homes, see masses of clutter, get it all cleared out and then end up with beautifully redecorated homes that look like stage sets. I enjoy watching the transformation. And like many other viewers, I also get a sense of smugness by looking at an out-of-control house. It makes me feel competent. But as I’ve watched these shows, what has stuck with me is not how chaotic some people are, but how much power the things they’re hanging onto — a grandmother’s armoire, a treadmill, clothes they’ve never worn — seem to have over their lives. That’s because we invest our memories, insecurities and anxieties in our objects, said Jamie Novak, a professional organizer and author of a new book, “Stop Throwing Money Away” (John Wiley & Sons). We all have items we’ve bought on vacation or received from a good friend or as a token from a wedding, and “the souvenir becomes the physical manifestation of that memory,” she said. But the object is not the memory itself, Ms. Novak said. She argued that we can still retain our memories of the good times even if we get rid of Aunt Sally’s sideboard or that life-size wooden toucan from Ecuador. If you really want to remember the piece, “take a photo of it before letting it go,” she suggested. The next challenge is to change our buying habits. On a future trip, for example, refrain from buying anything, or at least anything large. Or maybe purchase something useful, like a tote bag to cart around your groceries. I learned that lesson the hard way. It came in the form of a woolly skirt and vest I enthusiastically bought while traveling in Poland in my 20s. I then wore them to work back in Washington, prompting my former boss to tell me I looked like I had run into a llama. The same is true with shopping in general. To my surprise, over the years I have found it more satisfying to buy things once in a while, and actually enjoy that I can find them in my closet, rather than having lots of clothes stuffed in there making me feel guilty because I never wear some of them. More difficult is to discard something a relative or good friend — especially one who has died — has given you, even if it doesn’t fit your style or maybe even your apartment. And don’t dump these items on your children unless they really want them. “You can pass down the stories from them instead,” she said. Another reason we hate to give things away is the fear that we’re letting go of some of our dreams. That wet suit we bought with the plans to learn scuba diving and the sewing machine we thought would get us started on making clothes, they’re all gathering dust. But if we give them away, what does that say about our aspirations? “Having a French cookbook does not make you a French chef,” Ms. Novak said. Too many people eagerly run out and buy all the equipment needed for a sport or hobby, as if that alone will ensure they will devote themselves to it. Her rule is that you have to try something three times, whether it is fishing, knitting or mountain climbing, before you buy the equipment and accoutrements. If, for example, you think you’ll like camping, borrow a tent or get one at no cost on Freecycle (freecycle.org) “even if it’s not your favorite style or color,” she said. If it turns out that camping isn’t your thing, you can give it away again so it’s not gathering dust and cluttering your home. Also, because some equipment evolves so quickly technologically, that paraphernalia you bought five years ago is unlikely to be state of the art now. Why not let someone else use it and, when you have the time or inclination to really pursue that goal, buy the more up-to-date gear? There is also a generational element to how we collect stuff, said Dorothy Breininger, president of the Delphi Center for Organization. Older people, like those who lived through the Depression and World War II, may fear throwing out anything because it’s seen as wasteful. Those in their 40s, 50s and 60s might be storing items from both their parents and their children. But younger generations, “need none of it,” Ms. Breininger said. “They store everything online,” she said. “The question now becomes organizing everything on the laptop.” Reality television has pursued a more insidious twist on the messy household phenomena: compulsive hoarding, which is considered a mental disorder. It is as different from being merely disorganized as the occasional blues are from clinical depression. 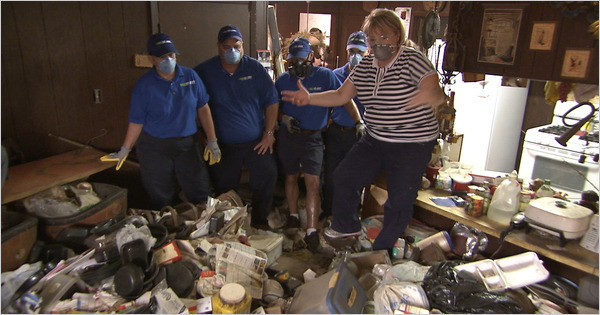 Ms. Breininger say that the popularity of the television show “Hoarders” on A&E, where she appears as an organizing expert, says something about people’s fascination with the subject. There is a clear difference between compulsive hoarders and people who simply have an excessive amount of stuff, Professor Frost said. Hoarders acquire a lot of things, but even more, they have terrible anxiety about getting rid of anything, no matter how useless it appears to be. While there are different approaches and degrees of difficulty in helping the simple clutterbug versus the compulsive hoarder, one thing is true for them both: it is unlikely that a huge one-time cleanup and overhaul is going to be successful without a follow-up. Ms. Novak, who once appeared as a professional organizer on the HGTV show “Mission: Organization,” said she discovered that when she and other professional organizers returned off-camera to the households they had helped make over, almost all had returned to their old ways. And if your brain refuses to think, you can always sit back, turn on the TV and watch other people get organized. Tips to Clear Your Path to a Clutter-Free Summer! WHAT’S YOUR 2017 DIGITAL GOAL?